Cervantes Corporation Limited (ASX:CVS) submit the financial report of the consolidated group for the half year ended 31 December 2018. 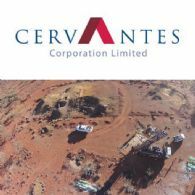 Cervantes (ASX:CVS) wishes to announce the updating of the Mineral Resource for its 100% owned Albury Heath Mine deposit and plans for further exploration work in the Albury Heath Project area. Cervantes Corporation Ltd (ASX:CVS) is pleased to provide the quarter activity report for December 2018. Cervantes Corporation Ltd (ASX:CVS) is extremely pleased to welcome Oakajee Corporation Limited (ASX:OKJ) to the Payne&apos;s Find area. As announced on 24 October 2018, Cervantes Corporation Ltd (ASX:CVS) engaged in a capital raising of $700,000 by way of a Prospectus. The prospectus closing date had been extended to allow any new investors and current shareholders to participate before the Company engages other methods to fund exploration of the current projects. 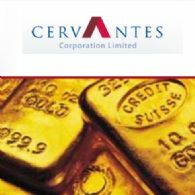 Cervantes Corporation Limited (ASX:CVS) announces drill testing of gold zones at Albury Heath intersect impressive quartz lodes. 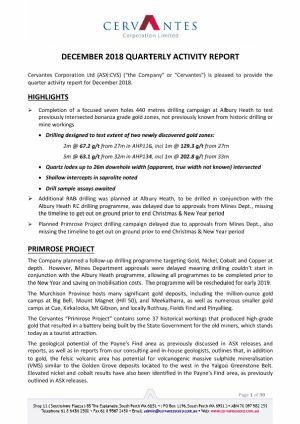 Cervantes Corporation Ltd (ASX:CVS) "Cervantes" is pleased to announce the completion of the follow up Reverse Circulation (RC) drilling program at the Albury Heath project in Meekatharra. As announced on 24 October 2018, Cervantes Corporation Limited (ASX:CVS) is engaged in a capital raising of $700,000 by way of a Prospectus, as released on 24 October 2018. 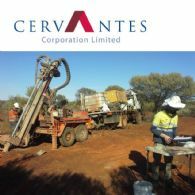 Cervantes (ASX:CVS) is pleased to announce that an RC rig has been mobilised to the Albury Heath Prospect (P51/2937, to commence drilling of this exciting new project) to follow-up on bonanza grade gold intercepts obtained in the previous drilling campaign. Cervantes Corporation Ltd (ASX:CVS) is pleased to provide the September quarter activity report. 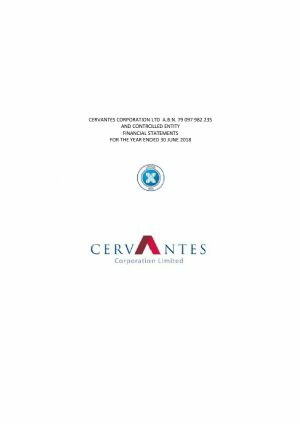 Cervantes Corporation Limited (ASX:CVS) Directors present their report, together with the financial statements of the Group, being the Company and its controlled entity, for the year ended 30 June 2018. Cervantes Corporation Limited (ASX:CVS) is pleased to present to you, Notice of our Annual General meeting, and look forward to your attendance. Cervantes Corporation Ltd (ASX:CVS) is pleased to announce a capital raising of $700,000 by way of a Prospectus as released today. A field inspection by two Directors of Cervantes Corporation Limited (ASX:CVS) of the Company&apos;s Primrose Project, centred on the Paynes Find Goldfield, was undertaken recently. The visit was prompted by discussions with Mr Doug Taylor, whose family are third generation miners in this historic and productive gold field. 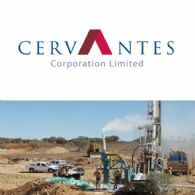 Cervantes Corporation Ltd (ASX:CVS) is pleased to provide an update on the rights and entitlements to an Iron sands venture introduced to Baraka Energy & Resources Ltd (ASX:BKP) by Cervantes in 2012. Cervantes Corporation Limited (ASX:CVS) announces Pansy Pit keeps giving Gold. Cervantes Corporation Ltd (ASX:CVS) is pleased to provide the June quarter activity report. During the June quarter, the Company commenced and completed inaugural drilling programmes at both the Albury Heath and Primrose Projects and finalised the purchase of the Primrose Project from European Lithium Ltd (ASX:EUR). Cervantes Corporation Limited (ASX:CVS) confirms more high grade gold at Albury Heath. Cervantes Corporation Limited (ASX:CVS) announces focused AC sampling delivers gold targets at Primrose. As announced 21 December 2017, Cervantes Corporation Limited (ASX:CVS) confirmed that the purchase of the Paynes Find Gold Project from European Lithium Limited (ASX:EUR) had settled. Cervantes Corporation Limited (ASX:CVS) announces Albury Heath drilling enhances resource potential. Cervantes Corporation Limited (ASX:CVS) has assessed Rotary Air Blast geochemical data from the Primrose Project collected by the previous tenement owners, European Lithium Limited. This drilling had been undertaken while that company was divesting the project area to Cervantes and has never been reported. With the authorisation of the submitted Programmes of Work, Cervantes (ASX:CVS) has mobilised two drilling rigs to its Primrose Project to start drill testing of identified targets. The Board of Cervantes Corporation Limited (ASX:CVS) has great pleasure in advising that the Company raised $281,397 from a placement in April 2018 as previously announced to the market, allowing the Company to pursue its current exploration programs and other activities. 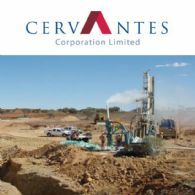 Cervantes Corporation Limited (ASX:CVS) wishes to advise that its inaugural drilling campaign at the Albury Heath Project has been completed. Cervantes Corporation Limited (ASX:CVS) is pleased to advise that the inaugural drilling programme at the Albury Heath Project is expected to commence on Thursday 3 May 2018. The drillers will mobilise Wednesday morning with the drilling expected to take 7 to 10 days to complete, depending on weather. Cervantes Corporation Ltd (ASX:CVS) is pleased to provide the March quarter activity report. Much like the last quarter, the Company has ticked over another milestone with the commencement of its inaugural exploration program since converting to an Exploration Company. Cervantes Corporation Limited (ASX:CVS) is pleased to advise that as a result of the recent shareholders meeting and approval of additional capital raising facilities, the Company has placed all of the available shares and attaching options. 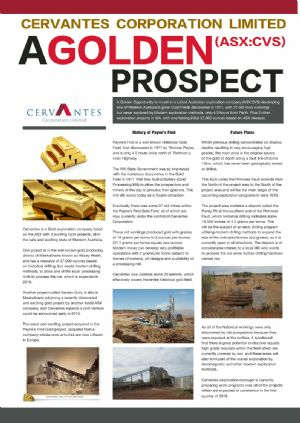 Cervantes Corporation Limited (ASX:CVS) is pleased to inform the market it has undertaken a comprehensive review of the gold exploration potential of the Primrose Shear. This shear is related to high grade gold mineralisation that was mined historically. The review took in work done by previous explorers as well as records from historic gold producers in the Paynes Find Gold Field. Cervantes Corporation Ltd (ASX:CVS) A Golden Opportunity to invest in a Listed Australian exploration company developing one of Western Australia&apos;s great Gold Fields discovered in 1911.